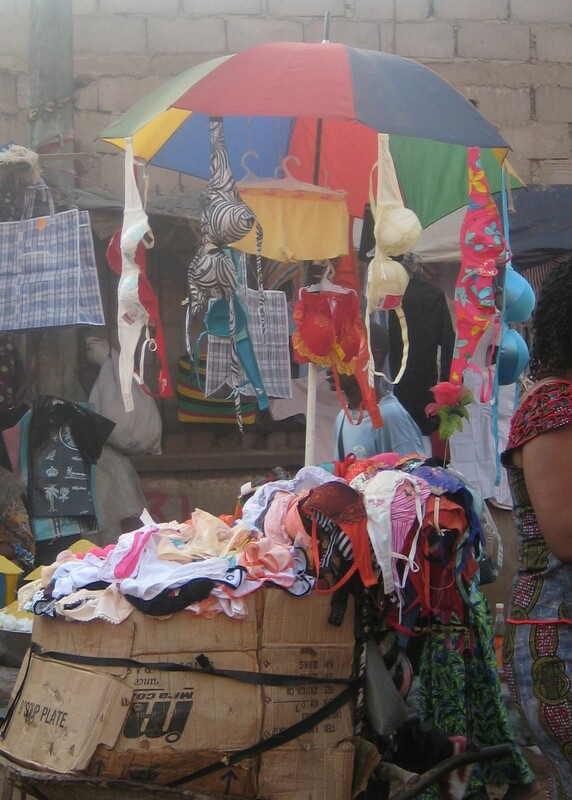 If you’ve never been to a market in Africa, Yaounde is a good place to give you an idea of what types of goods can be found there…… and, really, it’s EVERYTHING! From the umbrellas from which bras are draped for display purposes (which I have renamed Victoria’s Not-So-Secret, since they are sitting curb-side), to football (aka soccer) jerseys, to scrumptious looking pineapples, to piles of raw meat – just laid out on cardboard with flies circling (no thanks, I’ll pass on that one! ), to smoked fish, to knock-off purses or sneakers – I think that if it can be found in this country, it can be found at the market! 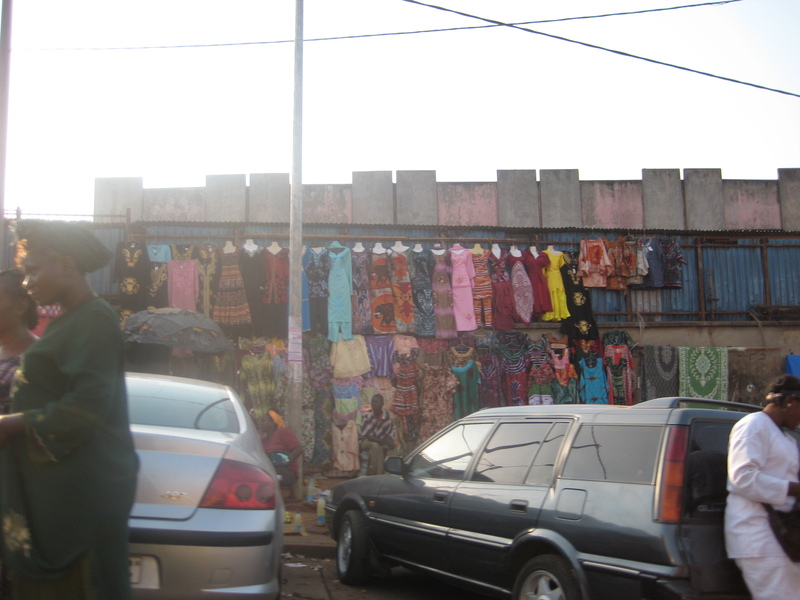 While I was in Yaounde, I had a chance to visit (or at least drive through) 3 different markets. The general market (which I think is called the Mfoundi market) is massive, and we drove through in a taxi while on a tour of the city. Our group took two cabs, with a local coworker in the first one. 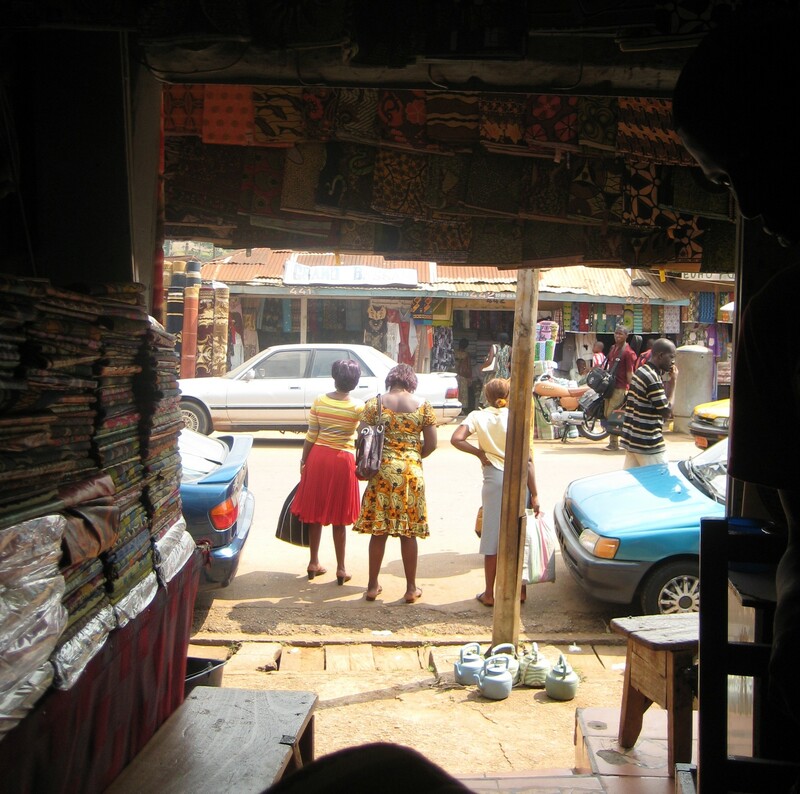 She asked us if we wanted to see the “real” Yaounde, and when we enthusiastically said yes, she told us it wasn’t the best area, but she would take us anyway. We split up into our two cabs, and my cab followed the one our local guide was in. The market was a chaotic scene, and though traffic seemed worse for vehicles than for pedestrians…. But not much better for pedestrians either! Looking down into the rows of stalls looked like a giant maze, and I when we turned the corner, I was impressed at how big the market really was. It was bustling with people negotiating and haggling and trying to get the best deals. I loved it! I don’t know if I’d shop there myself, because as a foreigner I’m sure I wouldn’t be able to negotiate the best deals, and call me crazy, but I’d rather my meat stay well-refrigerated until it’s cooked, but I loved the activity and energy of it all. Being visitors in this new place, another stop on our route had to include the Artisan market. That’s a nice way of saying the group of stands with souvenir stuff that tourists would like. Thankfully, our local friend P is one tough customer, as she bargains for us and refuses to let us be overcharged – this is helpful, because we have no idea what a reasonable price is! P negotiates and haggles with the best of them, and each of us walk away with a deal that we’re all happy with. Mine was a string of glass chevron beads, that apparently are traditionally worn by “notables” in some communities in the northern region of the country. P wasn’t entirely sure how much I should pay for these, as she said that because it’s something that in her community you might get as a gift if you got married at the palace, it’s not something that she would ever have thought of buying. But the first string of Chevron beads I looked at was quoted at somewhere around $200 US, so I walked away. The second stall I found some in quoted me around $100. P negotiated them down to $50, and I walked away quite pleased. Since doing some online research into the African bead trade and its history, I’m even more pleased as I have now seen some similar African chevron necklaces for sale online from $135-$300, and a Venetian one for $655! I first became interested in African trade beads when I was in high school, at a funky little bead shop in Lambertville, New Jersey where I made a necklace out of leather string, a few knots, and I think 3-5 beads that I wore every day for years, so I have always had a certain fondness for African beads, and am particularly happy with my souvenir. Another market that I visited was the fabric market. 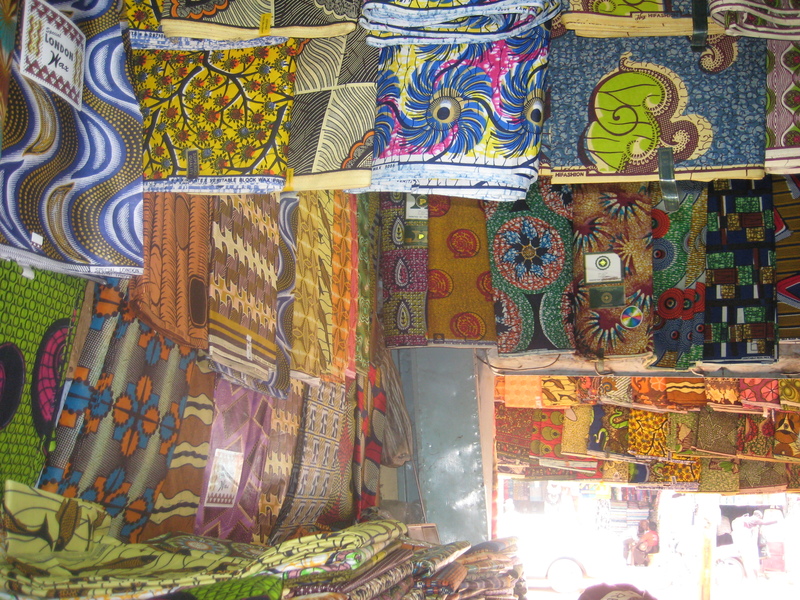 I really like all of the African Wax fabrics, and you can get all kinds in Cameroon. 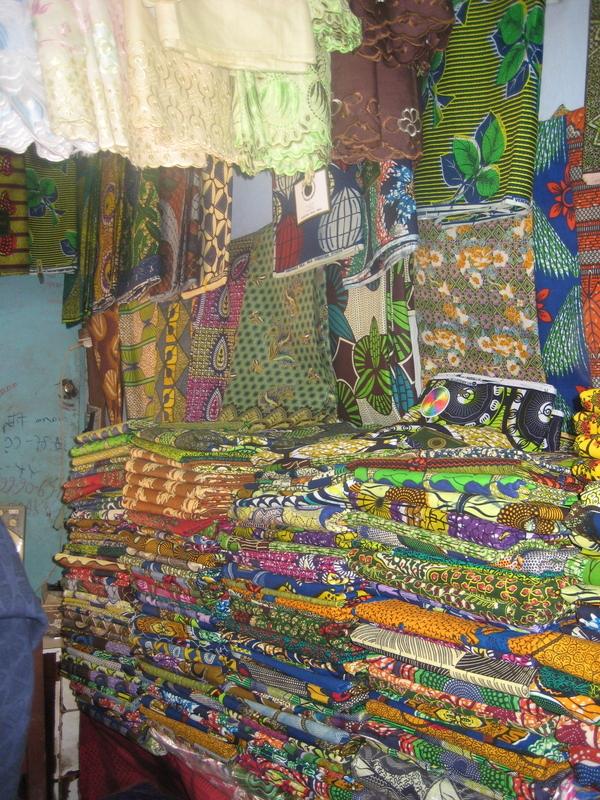 My friend C in Djibouti had told me before I left what prices were good when she visited Cameroon a while back, so I had an idea of how much I wanted to spend, and I had a request from C to bring back a few yards of fabric for her as well. Some of these fabrics very much remind me of Indonesian Batik fabrics, but with much more vivid print & color combinations. The varieties of patterns, colors, and fabric quality were overwhelming, and thankfully, I had another coworker showing me around who could play the role of power-negotiator on my behalf. Also, she knows more about the various levels of quality, so she could make sure I didn’t get ripped off. She also ensured that my selections were sufficiently “african” enough, so that when I tended towards something a bit more sedate and suited to my western roots, she would encourage me in the direction of a louder, bigger print with brighter colors. And I’m very glad she did because when I got home with my collection of fabrics (for which I had gotten a great deal) I was very pleased with the selection before me. My only regret? That I didn’t pick up some of the 2011 International Women’s Day fabric (or a dress made out of it), as I just like that they have a fabric for International Women’s Day! If you’d like to see a sample of it, click on this link. 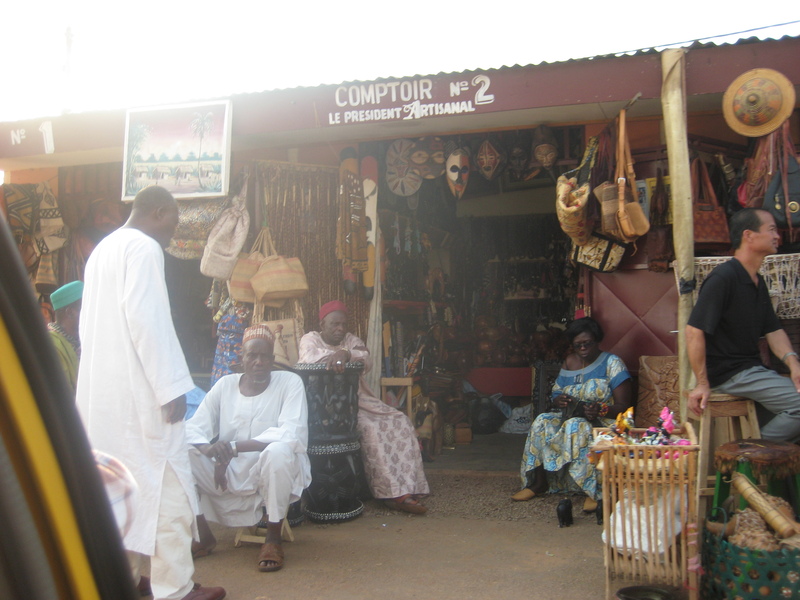 Overall, all my market experiences in Yaounde were a big success!! Thanks to all my tour guides and travel-mates for a great time!! Thanks! I haven’t spent any time in Kenya (except in transit at the airport – pre-fire), but maybe on a future trip! I’ll have to look for your post about the local markets at Diani Beach. I love the traditional fabrics as well. I bought several in Cameroon as well as in Nigeria. Both great places to find them!